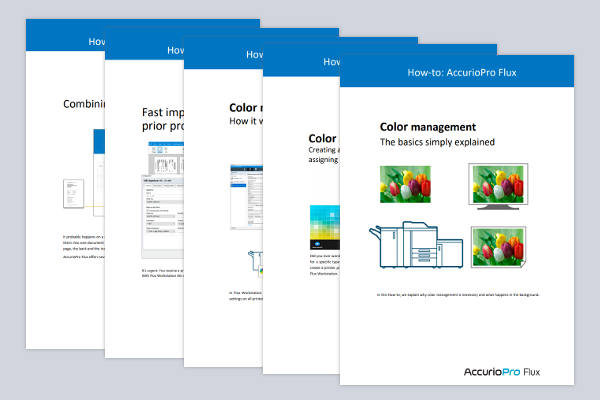 We published five new How-tos which show you how to use AccurioPro Flux to control the color management of your printers and how to quickly imposition urgent jobs without prior product configuration. We also introduce you to various methods for combining several print jobs into one order. How-tos are short instructions that help you set up your installation optimally. We show you how to use AccurioPro Flux most efficiently and how to further reduce manual work steps by learning some tips and tricks. In the past we have already published How-tos that explain, for example, how to print borderless with bleedless originals, how to save time with the print settings for serial letters, how to use PDF page boxes in Flux or how to optimally edit scanned documents in the Flux Raster Editor. → Here you can find a list of all availalbe How-tos. Take a look at the How-tos to use AccurioPro Flux even more efficiently.